Sisterhood membership has three requirements: Temple membership, Identification as a woman, and Dues. We have three dues levels: Member ($45), Sponsor ($72) and Patron ($118). However, membership is not denied to those who have financial hardship. For Temple men and non-Temple members (both men and women) who want to express their support of Sisterhood, we have a program we call “Friends of Sisterhood.” Men and non-Temple members become our Friend by declaring their support of Sisterhood through donating an amount equal to what a member pays in dues. 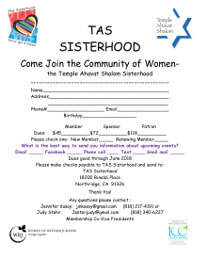 To become a member of Sisterhood, click on the image below to bring up the membership flyer. Print it, fill it out, and return it to the Temple with your dues. To become a Friend of Sisterhood, click on the image below to bring up the Friend flyer. Print it, fill it out, and return it to the Temple with your donation.